The Centers for Disease Control and Prevention Division of Population Health School Health Branch has released a new interactive online tool as part of the Whole School, Whole Community, Whole Child (WSCC) model. Through this online module, users can see how the ten components of WSCC are integrated throughout schools. Users will be able to explore the classroom, cafeteria, gymnasium, principal, counselor and nurse office, playground, surrounding community and the home. In each of these locations, users will be able to see how schools like theirs can be transformed to meet the whole child model. Explore the Virtual Healthy School here. The Gay Lesbian and Straight Education Network (GLSEN) has released a new survey report that provides a look at the current landscape of bias, bullying and victimization reported by students and teachers across the U.S. This survey looks at several different types of bullying and bias based on race/ethnicity, religion, ability and body size. The report focuses on LGBTQ issues in secondary schools and examines progress that has been made over the past ten years. Furthermore this report offers solutions and recommendations for strategies that educators and advocates can use to improve school climates and minimize bullying. The survey addresses the student/teacher perception of school climate, how students experience safety, bullying and harassment, and teacher intervention in bullying incidents. Read the survey report and find out more. This toolkit, provided by the Guttmacher Institute, is an update to the 2014 edition of the tool kit of the same name. This updated version provides specific instructions for facilitating a two day workshop on the Demystifying Data guide. The workshop toolkit includes seven presentations which focus on using data to address common issues in efforts to improve young people’s health and rights, steps to developing strategies and what to do with missing data. Additionally the workshop toolkit also includes four informational handouts that can be used to guide participants through the workshop and provide additional support. Download the workshop toolkit, presentations and handouts. The Centers for Disease Control and Prevention (CDC) has released an updated factsheet on the risk of HIV/AIDS among Gay and Bisexual Men. This factsheet outlines the risk statistics of gay and bisexual men, with particular attention to black and Latino men. According to recent data, “From 2005 to 2014, HIV diagnoses decreased in the United States by 19% overall, but increased 6% among all gay and bisexual men, driven by increases among African American and Hispanic/Latino gay and bisexual men.” The factsheet also includes an informational graphic which estimates new HIV diagnosis among the most effected populations, as well as facts about effective prevention methods and living with HIV. Lastly this factsheet includes links to supplementary HIV/AIDS resources for further information. Click here to read the factsheet. The Sexuality Information and Education Council of the United States (SIECUS) has released an interactive map of the U.S. profiling each state for the fiscal year of 2015. Each profile depicts a continued gradual departure from abstinence-based programs toward evidence informed and medically accurate sexual health programs. These profiles are intended to be a resource for advocates, educators and policy makers to see how progress can be made and changes in approaches to programing can be transformed for better sexual health outcomes. In addition to the state profiles, this report also contains information on HIV/STD education laws by state. View state profiles and find out more here. Young Women’s Contraceptive Decision Making: Do Preferences for Contraceptive Attributes Align with Choice? Published by the Guttmacher Institute, this paper examines a study which focusses on understanding how womens’ preferences for contraceptive methods relate to their method choice and how it can inform the content of contraceptive counseling. Drawing on the 2009 Survey of Reproductive and Contraceptive Knowledge this paper shares the results, methodologies and findings from a sample of 715 women who have ever used contraception and analyses their responses in order to determine how contraceptive counseling can be improved. The paper concludes that most women desire effective methods for pregnancy prevention, yet it is not clear how this relates to their contraceptive use. Read the full paper here. The Centers for Disease Control and Prevention (CDC) has released new recommendations for specific contraceptive methods. Updates to these recommendations include methods that can be used by women who have cystic fibrosis, women with sclerosis and a variety of other health challenges. These new recommendations are intended for health care providers and educators, as well as counselors who educate women, men and couples about contraceptive choices and family planning. Read the new recommendations here. 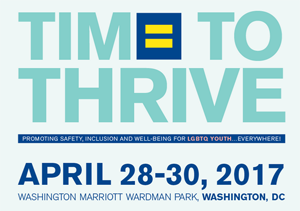 The Human Rights Campaign, in partnership with the National Education Association and the American Counseling Association, is hosting the fourth annual Time to Thrive Conference on April 28-30, 2017 in Washington D.C. This conference will focus on promoting safety, including the well-being for LGBTQ youth locally, nationally and internationally. It will also address the challenges that many LGBTQ youth face including family rejection, bullying and daily concern for safety. The Time to Thrive Conference is intended for educators, staff of community based or after school programs, clergy and leaders of religious education programs, K-12 educators and health professionals. Register for the conference, review the agenda and find out more about Time to Thrive. The Southeastern Health Equity Council (SHEC) has released a guide containing resources, trainings, institutions and publications about cultural and linguistic competency which is intended to be released to stakeholders and partners to address cultural barriers in the health care field. As a compliment to this guide, SHEC is also hosting a series of three webinars aimed to support this guide. The first in this series of webinars will be focused around the Hispanic/Latino population. The webinar will take place on October 13, 2016 from 2-3pm EDT. The goal of this webinar is to define cultural competency; describe the diversity within the Hispanic/Latino community, explain the relationships among culture, language and health within the Hispanic/Latino community; and identify cultural competency assessment and evaluation tools. SHEC Cultural Competency Resource Guide and White Paper. Register for the SHEC Cultural Competency Hispanic/Latino Webinar. Each year on October 15 , the National Latino AIDS Awareness Day (NLAAD) promotes awareness and advocacy for HIV testing, prevention and education as well as raises awareness surrounding other health issues such as hepatitis and STIs. Though NLAAD works year round on their campaigns and efforts, October 15th marks the annual AIDS awareness day in the Latino community. NLAAD mobilizes community based health organizations, leaders of the Latino community, health officials and public leaders to spread awareness and advocate for improvements in HIV and related health risks. NLAAD supports local community organizations and clinics around the United States in Latino communities by offering webinars, promotional materials, webinars, HIV testing kits and other resources. On October 15th NLAAD will be hosting a National Latino Aids Awareness Day Memorial in San Diego California. Learn more about NLAAD. World AIDS Day held every December 1st was the first global health day aimed at uniting people worldwide in the fight against HIV/AIDS. From encouraging HIV/AIDS prevention to showing support for people living with HIV and remembering those who have died. While it is months away, it’s never too early to get ready and show your support. Learn more about World AIDS Day.